Creating the citizens of Zootopia brings one word to mind, diversity. 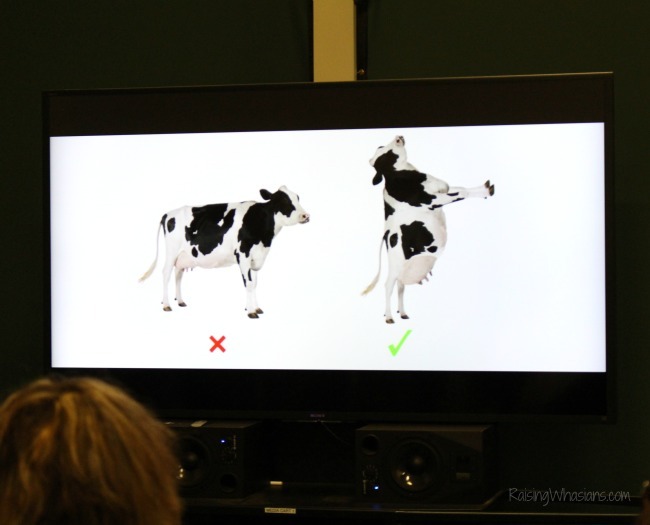 As no two animals are exactly alike in the real world, the animators had the challenge of making sure that each animal created is as unique as you and me. So before the pencil ever hits the paper, the Disney animators are hard at work researching and dreaming! We sat down with Art Director Cory Loftis for an exclusive session on Zootopia animation. How long should a fox’s snout be? How big should a bunny’s eyes be? How should a camel walk? Everything in Zootopia is based on the combination of real animal behaviors and real human behaviors. So it’s only natural that animators would need to grasp these behaviors by studying animals in their natural environments. ZOOTOPIA – Character Concept Art of Judy Hopps by Cory Loftis (Character Design Supervisor). ©2015 Disney. All Rights Reserved. One of the most interesting parts of our session was seeing all of the concept art. Animators have such a creative perspective when it comes to bringing the characters to life, that often goes unnoticed. I got a real appreciation for the early drawings, sketches and imagination that went into the evolution of characters from the animators’ minds to what we see on screen today. Talk about perfectionists. Disney animators are geniuses when it comes to attention to detail. 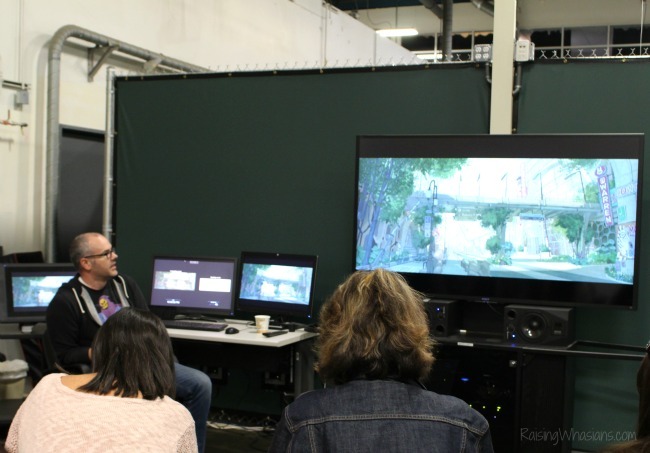 From buildings to streets, grass to trees, the world of Zootopia has been brought to life from the minds of creative animators. And the stars, the animals bring so much more detail than I could have imagined. Over 1,000 unique animals have been brought to life by this team. And it’s not just one thing to create one animal species. Then you have to vary the shape, color and personality to create a 100% unique animal within the species as well. The details go even more specific than that. 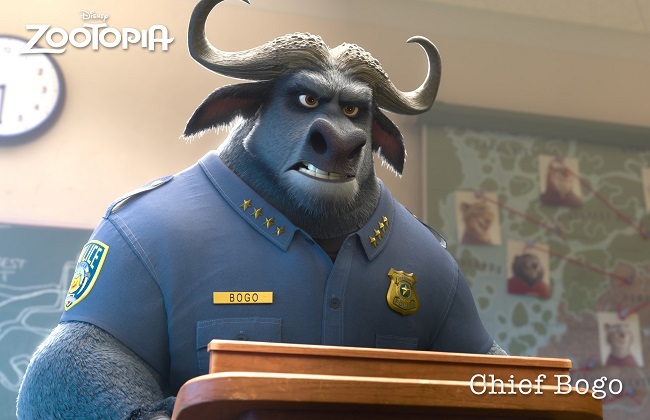 For instance, Cory Loftis explained how much they cared about what Police Officer Chief Bogo wears in Zootopia. Because Chief Bogo is a “big guy” especially in the upper body/neck region, animators were concerned with the typical officer button down shirt and tie look. So they surveyed weight lifting police officers. So the dark t-shirt under the usual button down police shirt? It’s 100% intentional, all because animators wanted an authentic “police officer look” for Chief Bogo. And that’s not the only details that animators are concerned with. Remember the new Fur and Keep Alive Animation Techniques? Every tiny detail has been addressed with this film, making Zootopia unlike any other Disney animal movie you have ever seen! So after the presentation was done, Cory Loftis gave us a step by step drawing demonstration. Projecting his hand sketch of Officer Hopps directly on the screen, we were to pick up our pencils (which had NO erasers by the way…in my defense) and paper and follow along with the creative genius. Easier said than done. 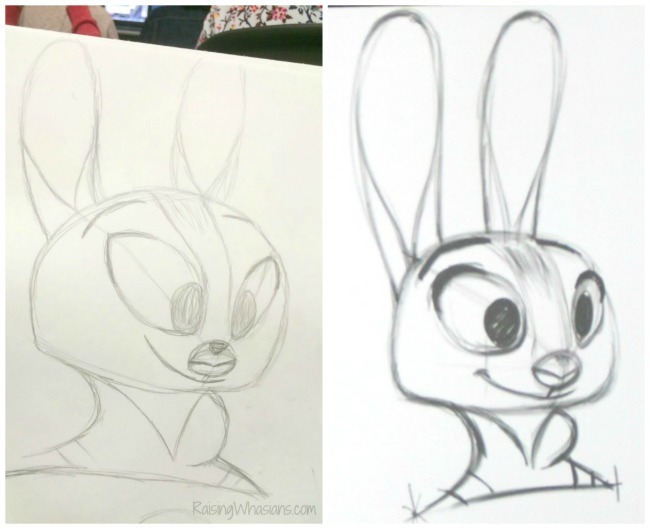 Already having my scaling off on the page, it was completely overwhelming to see how just a small adjustment to eye shape, mouth spacing, ear contour can ultimately make my Officer Hopps look like…well, a mess. Does my drawing even compare to the master’s? Nope, not a chance. But while my childhood dream of becoming a Disney animator may have been crushed, enjoying a whole afternoon immersed in Disney Zootopia and the animation process was everything I had hoped. Creating 1,000 unique animals, learning about the processes and getting the inside scoop, I definitely felt like a Disney animator…if only for a few minutes. Be sure to check out the rest of my exclusive Zootopia insider posts, free printables and more and get ready for the most epic animal movie for Spring 2016. 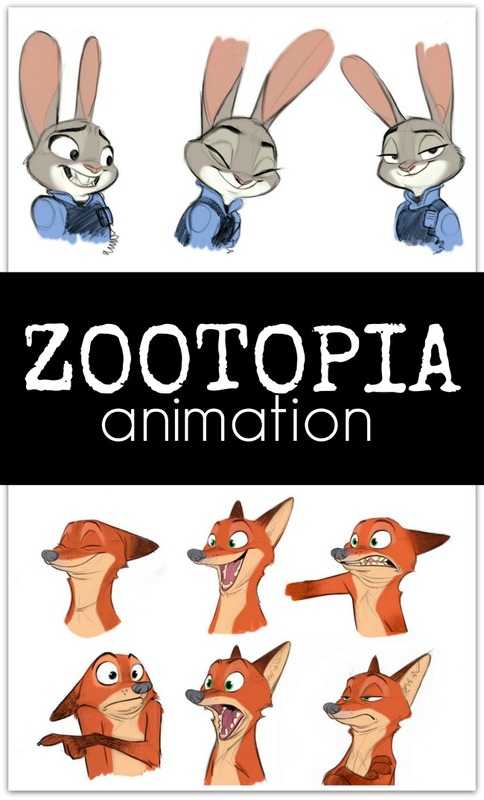 Check out the attention to detail from the Disney animators with Zootopia, in theaters on March 4, 2016! I attended an all-inclusive Disney press event in exchange for this posting. All opinions are my own. Be sure to follow Raising Whasians via Facebook, Twitter, Google, Instagram, Pinterest and YouTube for more exclusive movie updates, interviews, and more! This behind the scenes stuff is cool! Thanks for the info on animation! This would have been a lot of fun. This looks like it is going to be a great movie. 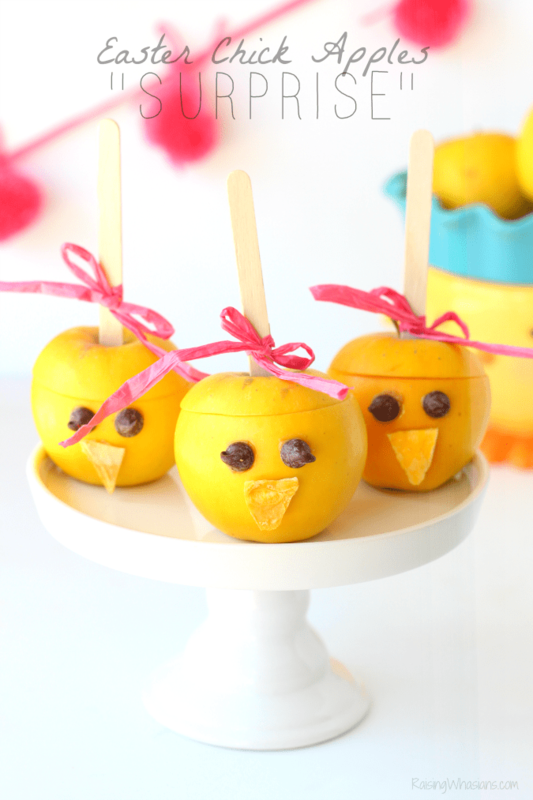 How fun is this. I love animation, so awesome! Zootopia looks like such a cute movie. I can’t wait to see it. So cool!! Can’t wait to see this movie! This really makes me appreciate how much work goes into creating these memorable characters. They must spend so much time on every little detail. I like how hard the animators worked to make the characters accurate and realistic. This movie is going to be so much fun! I am always impressed with the creativity and detail that goes into making these animated characters come alive. This must have been such an amazing experience – you’re very lucky. Im living through you girl I have always wanted to go through a Disney press event! 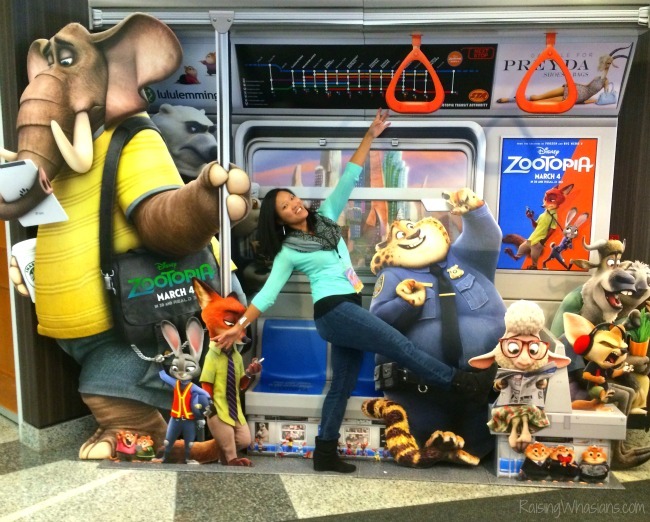 I love the recap and the attention to details you got to explore for the upcoming Zootopia movie! That is an adorbs pic of you! I like seeing animation at work. Fascinating. Wow, there is a lot of detailed work that goes into modern-day animation! I am glad you enjoyed yourself and interesting to learn you once wanted to be an animator. It really is incredible how the animators can make it seem so real. Of course there are walking & talking animals! In another life I’m going to be a Disney animator! I am always so impressed with the beauty of their characters and scenes.